Stems rather stout, or slender and stiff, smooth and usually glaucous, branched above or simple, 2 to 4 feet high, from a thick, perennial root. 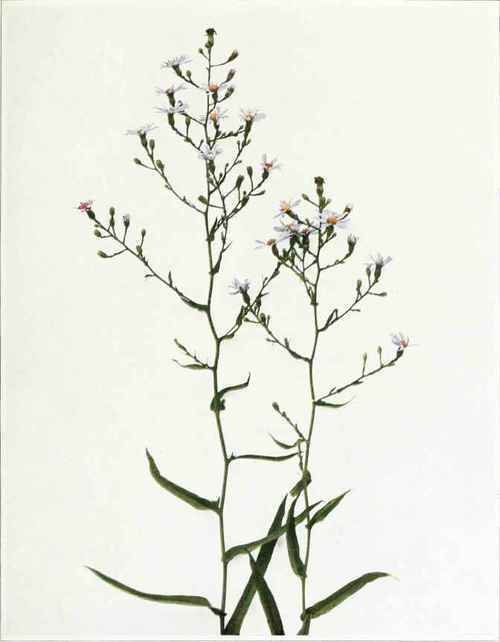 Leaves thick, smooth, slightly rough on the entire or slightly toothed margins, the upper ones sessile and clasping the stem by a heart-shaped base, lanceolate to oblong-lanceolate in shape, 1 to 4 inches long, one-third to 2 inches wide; the lower and basal leaves gradually narrowed into margined petioles; the leaves of the branches visually reduced in size. Heads of flowers numerous, about 1 inch broad; bracts of the bell-shaped involucres rigid, pointed, green-tipped, appressed and overlapping in several series. Ray flowers fifteen to thirty in number, blue or violet; pappus tawny. In dry or sandy soil of open fields and thickets, Maine to Ontario and Saskatchewan, south to Alabama, Louisiana, Missouri and Colorado. Flowering from late August to October.